Shortly after Gosport.info started to become better known and more fully completed site, I receiced a call from Mr Syd Ashby offering to do an interview for Gosport.info. I was very new to this so I feel did not make a good job with the questions. I visited him in his flat in one of the Harbour Towers. I did see a lot of photographs and other mementoes and memorabilia. I should have made a list or asked to take photos, as I said I was new to this. I will try to find the notes to see if I can add anything.Syd Ashby a twin and the youngest member of a well known family dating back to 1898, in Gosport. Six members of his family served with the Royal Marines. 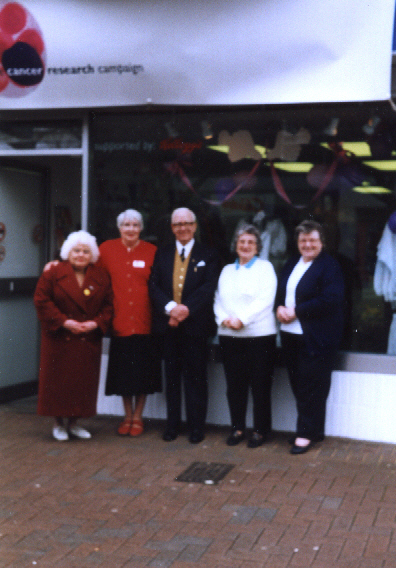 Syd Ashby and Staff at Change of Name to Cancer Research Campaing at Gosport shop. 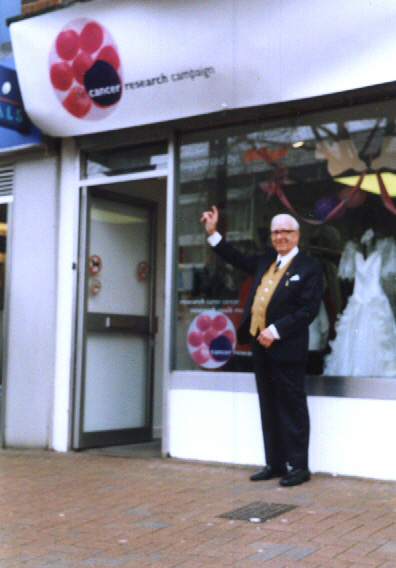 He joined ‘Milletts’ in Gosport High Street in 1931, retired as Manager in 1981 and then went back part time for a further 3 years, making 53 years in business. As a business man he was always shown great respect from all his staff and fellow business men in town. He served as President of the Gosport Chamber of Trade in 1959, 1967 and 1973.
for what was then called the British Empire Cancer Campaign. Now it’s the Cancer Research Campaing and Syd has received a Gold Award for 50 years service and has received an additional award this year. At 83 years of age he still collects in the High Street and in the local Super Stores for the Cancer Research Campaign, Age Concern, the British Legion and several others when asked. He was the longest serving member of the Gosporteers which, among other activities, raises money for the Mayor’s Charities. He is Vice President of Gosport Voluntary Action. 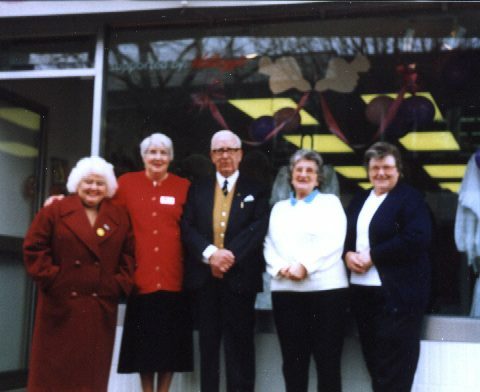 He is the only surviving member of the original committee which opened Northcott Homes where he was twice presented to Queen Elizabeth the Queen Mother. Photos at the change of name to Cancer Research Campaign.